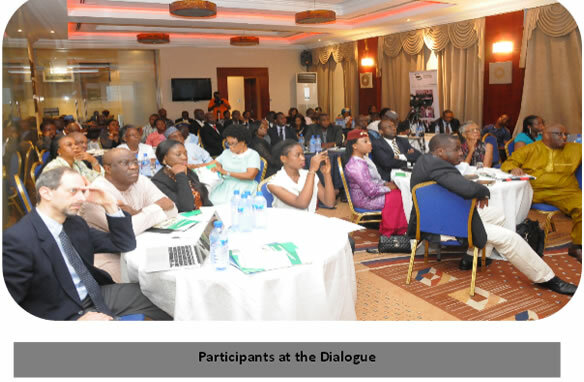 The Forum for Inclusive Nigerian Development (FIND) organized a Dialogue on the theme “Promoting Sustained Development and Inclusive Growth of States in Nigeria.” The Dialogue took place on Tuesday, 12th April, 2016 at the Protea Hotel, Ikeja GRA, Lagos. The main goal was to generate ideas that can be used as a template for FIND’s proposed engagement with states towards promoting economic diversification and inclusive growth. The event was attended by eighty people from different sectors including government, civil society organizations (CSOs), professional bodies, media, academia and the private sector. The Dialogue was structured in two parts: The morning session comprised presentations by Ms. Fatma Samoura, UNDP Resident Representative; Prof. Douglason Omotor, of the West African Institute for Financial and Economic Management (WAIFEM), Lagos; Dr. Oluyomi Ola-David of the Department of Economics and Development Studies, Covenant University, Ota, Ogun state; Dr. Chuma Ezedinma, Officer in Charge of the Regional Office, United Nations Industrial Development Organization (UNIDO); and Dr. Oluwole Ogundipe of SocketWorks Limited. All the speakers agreed that although Nigeria had experienced growth in the past few years, it did not translate to inclusive economic development. Numerous suggestions were made on how states could achieve sustained growth and inclusive development, including the use of ICT for effective revenue collection, provision of infrastructure, collaboration with the private sector, encourage investors in sectors that generate employment and add value among others. Participants also had the opportunity to ask questions, make comments and share experiences. Participants met in different groups during the breakout sessions on the four themes of inclusiveness, revenue mobilization, the real sector and governance. The groups had robust discussions on the questions for the different themes and came up with responses that will be used in developing FIND plans for engagement with states. Overall, the Dialogue was successful in achieving its objectives. 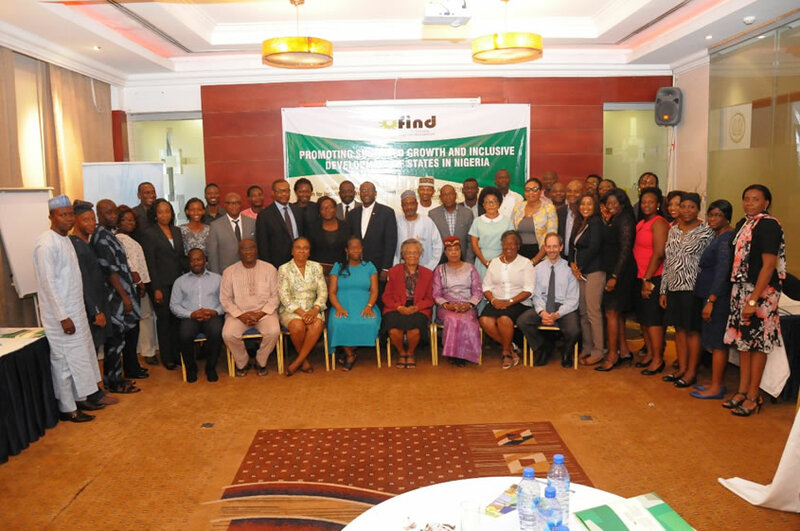 Participants gained increased knowledge on sustainable development and inclusive growth in Nigeria; ideas for states to diversify and achieve inclusive growth were generated; and there was increased awareness about FIND and its activities. The event also provided opportunities for networking and collaboration among stakeholders. The collapse of global oil price has taken its toll on the Nigerian economy. The current administration and the public have continued to deliberate on how to respond to the unrelenting dive in oil price and its impact on government revenues. Many states are unable to meet their statutory obligations and there seems to be no light at the end of the tunnel. Only a few states have partially been able to offset the drop in Federal oil revenue transfers by increasing their Internally Generated Revenue (IGR). Today, there is urgent need for economic diversification and inclusive growth in the states, based on sound and publicly acceptable strategies for increasing IGR. Leaders in government, business and civil society can learn important lessons by examining what has been tried, what has worked and what has not in states’ efforts to create inclusive growth and build up their IGR. In pursuit of solutions to the inclusive growth and revenue challenges, FIND is beginning to work with states to promote economic diversification and inclusive growth. 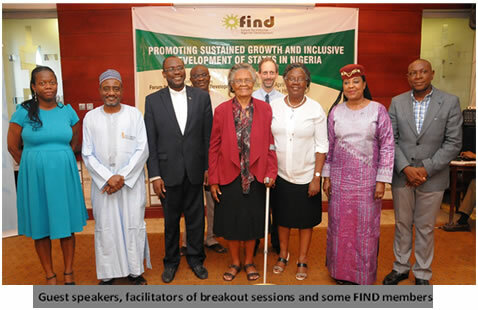 As a starting point, the FIND team thought it best to organize a dialogue session on the theme “Promoting Sustained Growth and Inclusive Development of States in Nigeria”. The primary aim of the Dialogue was to generate ideas from key stakeholders that would feed into state-specific plans that states can adopt to diversify their economies, improve their IGR and ensure inclusive growth; as well as explore the potential for state-level partnerships and collaboration among the states and FIND. 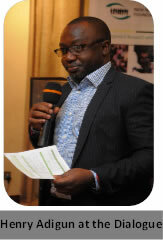 The Dialogue was moderated by Henry Adigun, Team Lead, FOSTER and FIND member. Co-conveners of FIND, Prof. Obafemi Ajibola (New Nigeria Foundation) and Mr. David Fairman (Consensus Building Institute) gave an overview of their respective organizations, while, Dr. Dorothy Oqua, Country Director, Howard University and Continuing Education Centre, Nigeria and FIND member gave a brief description of FIND and its activities. The Chairman of the event, Prof. Akpan Ekpo, Director General, WAIFEM also a FIND member, noted that many states are in big trouble and are unable to pay salaries. He advised that states should depend less on federal government and oil, and urged participants to participate actively in the deliberations, because the outcomes would serve as a template for the interventions at the state level. Resource Mobilization for Inclusive Development: Taxation, Public Acceptance, Sources and Collection. Good Governance and Service Delivery at State and Local Government Levels. Rural Economic Transformation and Employment Generation: Inclusive Growth, Employment Creation and Unemployment. Growing the Real Sectors: Agriculture, Manufacturing, Tourism, etc. – Incentives, Enablers and Agenda for Action.Eighty participants (30 females and 50 males) attended the Dialogue. They were from diverse sectors including government, civil society organisations, private sector, academia, professional institutions, international development agencies and the media. Speakers: The guest speakers were carefully selected from a spectrum of sectors. Their presentations captured various perspectives around the theme. Ms. Fatma Samoura delivered a speech on “United Nation’s Support for Equitable and Sustainable Growth in Nigeria: Emerging Results and Roadmap for the future.” She was pleased that the Dialogue was taking place at a time when the Nigerian government was concluding on the budget, planning to host a major economic summit and developing strategies for mainstreaming the Sustainable Development Goals (SDGs) into policies, plans and implementation frameworks. She observed that Nigeria has achieved some growth since independence but such growth has not translated to significant reductions in the rates of unemployment, poverty and income inequality, noting that two out of every three Nigerians live below the poverty line with the most affected being women and young people. Ms. Samoura highlighted key areas where the UN is working in promoting and supporting government efforts aimed at diversifying the economy and making development inclusive and sustainable. These areas include institutional capacity building in the real productive sector such as agribusiness and agro industrialisation, renewable energy solutions and industrial energy efficiency, and youth employment schemes, among others. She emphasized the need for structural reforms in order to attain growth that benefits all Nigerians; and pledged her support for FIND initiatives and for other actors interested in promoting sustainable growth and inclusive development which will help Nigeria to attain the SDG. The title of Prof. Douglason Omotor’s presentation was “Mundane Diversification Strategies for Inclusive Development of States in Nigeria.” The paper appraised current and global economic events such as declining oil prices, depleting revenue, declining capital flows, and currency depreciation in emerging market economies dependent on natural resource exports. The presentation also drew attention to the Nigerian economy with an emphasis on revenue sharing and collection, debt burden, domestic resource mobilization challenges (taxation and internal revenue generation), among others. He asserted that while there is ample evidence to show that reducing inequality can strengthen economic growth, it is still more an “aspiration than prescription” in Nigeria. This is because of a lack of recognized policy framework and corresponding set of indicators that would guide governments wishing to establish a more socially inclusive economic strategy. Prof. Omotor noted that services and agriculture sectors contribute the most to the GDP, while others like wholesale and retail trade, telecommunications, and manufacturing also contribute in varying degrees. The housing and the real estate sub-sectors were regarded as sectors of the economy where policy could encourage further growth, as reflected in the recent rebasing. Prof. Omotor also agreed with Ms. Samoura’s assertion that Nigeria’s growth performance has not resulted in inclusive economic development and stated that the quality of services provided is poor and “rudimentary”. He noted that state governments rely heavily on the revenue allocated from the federation account and are currently running deficit budgets, coupled with their inability to pay government workers and contractors. Prof. Omotor emphasized that taxation was the way out for most states to generate revenue. He highlighted some lessons from the “Lagos model,” including the state’s ability to widen the revenue base to cover the formal and informal sectors, legislative reform to discourage multiple taxation, investment in quality infrastructure and service delivery, transparency of government, promotion of a tax-paying culture through building of confidence and trust between government and the citizenry, adoption of participatory approach in tax assessment and reform, as well as recruitment and retaining of high quality staff by the Lagos Inland Revenue Service (LIRS). The success of the Lagos model was also attributed to the operation of a policy where all taxes or payments to the state government are made directly to designated banks. Prof. Omotor held the view that since other states shared similar characteristics with Lagos, there are opportunities for them to improve their IGR, like Lagos. Dr. Oluyomi Ola-David made a presentation on “Promoting Inclusive Growth in Nigerian States.” She observed that the global concern about inequality has led to new thinking on “inclusiveness” and the need to restructure economies to focus not just on ‘fast growth’ but on inclusive growth that creates economic opportunities and ensures equal access to them (including the poor and vulnerable). She supported earlier assertions made by other speakers that although investments in Nigeria have brought about growth, increased economic activities and opportunities, Nigeria still ranks very low in social and Human Development Indicators (HDI), stressing that the benefits of growth must be available to all, not just a few. Develop a job creation strategy focused on sectors that create opportunities for value addition and have greater potential for job generation. (The March 2016 Dalberg report on Job Creation Strategy was referenced as a good resource that states should study and use). Focus on sectors that are mass employers such as agri-business, wholesale/retail trade, transportation, etc. Leverage on ICT to generate jobs. Track progress in job creation. Advocate for a job creation management system where states can account for the jobs created. Increase partnership between government and the private sector. Involve citizens in policy formulation so that it benefits all. Ensure rural economic transformation by encouraging investments in rural areas. The presentation titled “Supporting Inclusive and Sustainable Industrial Development in Nigeria, Experiences from UNIDO” was made by Dr. Chuma Ezedinma, Officer in Charge, United Nation’s Industrial Development Organization (UNIDO) Nigeria. The presentation provided an overview of UNIDO’s work in Nigeria in promoting inclusive industrial development which contributes to the achievement of Sustainable Development Goal (SDG) 9. Dr. Ezedinma reiterated that Nigeria has experienced fast growth but in the last year had a drastic reduction in rate of growth, particularly in the manufacturing sector which recorded negative growth. Need to decentralize “power” and decision making from the federal to the state government. “Efficiency is greatest when decisions are made closest to points of implementation”, he asserted. The final presentation was by Dr. Oluwole Ogundipe, Managing Director of Socket Works Limited. He made a presentation on “Transforming IGR – ICT as the Difference Maker.” He noted that one of the constitutional responsibilities of state and local governments is to generate revenue to meet their obligations. However, states and LGAs face the challenge of mobilizing appropriate levels of revenue mainly from local tax collection. He identified some of the challenges of revenue collection as billing, leakages, lack of transparency, lack of resources for effective and efficient collection, non-compliance with directives to adopt e-payment, lack of integrated revenue collection strategies, and others. In his opinion, ICT is the difference maker to some of these challenges. This is because it allows payments to be tied to bills and invoices thereby minimizing reconciliation issues, using banks and other financial institutions for revenue collections, integrating existing approaches with revenue collection and monitoring of payments by stakeholders. Dr. Ogundipe assured all that the benefits to stakeholders from effective collection systems are enormous. He assured there would be an increase in revenue generation, improved consistency and accuracy of information across the entire value chain, faster access to payment information, ability to estimate returns and track costs, and reduction in processing cost, reconciliation and faster distribution of standard processes. Overall, the presentation provided an insight for optimizing the potentials of tax collection through ICT in order to achieve greater efficiency, transparency and accountability. Government policies overtime have focused on the demand side by the use of monetary policy that has doubled in this country’s economic policy. The supply side is fiscal policies has been less emphasized. This will help tackle the issues of increased productivity, growth, employment, and increased revenue generation therein. 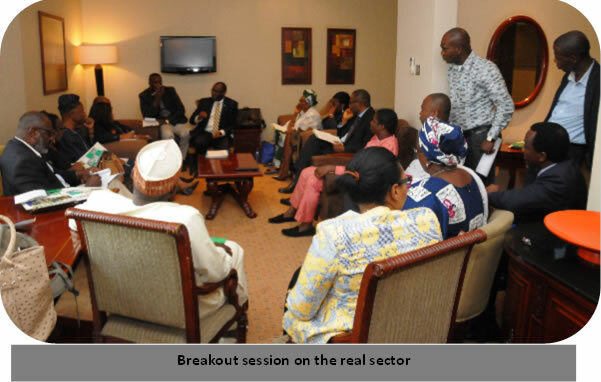 The issue of revenue generation can be expanded during the break-out session. I have a lot of statistics on these being a part of the Lagos model which is still highly imperfect. Many of the states and the federal government are aware of the abundant resources/endowments but they need the right personnel and political will to drive further action toward harnessing the resources for optimal benefits. They need to examine their area of comparative advantage and cost benefit analysis instead of a state trying to copy another one like Lagos state. Government needs to work with the private sector. They need to create investment agency, organize investment forum, etc. The revenue sharing formula is not helping the country. Some states are not receptive to business investment and success while others are. Contributory revenue is a better option for the centre. Internally generated revenue is subject to basic ideas in tax and rates administration. The Chairman, Prof. Akpan Ekpo, concluded the session by emphasizing the importance of inclusiveness in order to guarantee sustainable growth and suggested that states should be interested in development, not just in regard to improving the GDP but in terms of other social development indicators. He also emphasized the importance of industrialization and the need to address issues relating to the environment and good governance. All of these, he concluded are important for sustained growth and development. Growing the Real Sectors - Agriculture, Manufacturing, Tourism, etc. – Incentives, Enablers and Agenda for Action. Each group responded to series of questions provided under each thematic area. The questions were designed to help stimulate robust discussions among participants. Good governance can be defined as the practice of delivering with transparency, accountability and effectiveness; governments responsive to people’s need; rule of law for citizens, business and investors; and government and citizens having consciousness of each other and the participation of all people. Citizens’ participation in governance can be increased through effective stakeholder engagement with clear communication patterns to get the buy-in of citizens, participating in budgeting through town hall meetings with a feedback mechanism to monitor the progress of budgets. Effective demand for good governance can be promoted through effective advocacy by citizens to government; civil and political education of citizens and effective enforcement mechanisms to deal with impunity. The roles of different stakeholders in ensuring good governance should be differentiated based on state and local context and there should be regular reporting to citizens by those in power. Good governance and service delivery can be measured through a set of key performance indicators. Good indicators include participation, delivery, accountability and responsiveness. Government service delivery can be more effective and accountable at the local level through building the revenue base and education of state assemblies to discharge their duties. The local government is the most critical government to the people as it has direct link to the people. The local government should be the creation of the states and not the federal government. There needs to be clearer relationship between state and local government with respect to fund allocation/budgeting, and service delivery. Sectors of the economy with high potentials for employment generation include aagriculture, environment, ICT, hospitality, social media, solid minerals and construction. States and LGAs can be enablers for employment generation by reducing multiple taxation and providing tax-free holidays to start-ups; enacting policies that support linkages between big and smaller firms and promote SMEs; empowering relevant institutions and building the capacity of SME’s to improve the quality and standards of products; and promote infrastructure to support growth of the SME sector. To avoid stifling employment, government should facilitate business and provide an enabling environment for growth and development, facilitate private public partnership development and ensure consistency and continuity in policy. To encourage private sector employment generation, state and local governments should create awareness on government policies and provide direction for industrial growth and development, have regular engagement with private sector stakeholders and establish communication strategies through print and electronic media, town hall and village square meetings etc. In order to ensure inclusiveness in economic growth, state and local governments should conduct stakeholder analysis to find out how policy affects the weak and vulnerable, enforce proper implementation of policies and plans, conduct a market system analysis of all viable sectors, and ensure proper participation of all. To ensure that states’ economic growth plans do not dispossess the under-privileged, government should develop a qualitative database of the under-privileged, analyse their roles and services and come up with alternative solutions. States can improve on the ease of doing business by adopting a one-stop approach, creating specialised industrial clusters/parks for businesses, establishing a common facility centre for the enterprise which is demand driven and grouping micro business into associations and using the platform to ease regulatory agencies’ and other federal and state tax issues. To encourage investors states need to guarantee security, power and other infrastructure that can make businesses thrive. They need to provide incentives for investors, encourage consistency in policy and regulation. States also need to promote their comparative advantages and improve their capacities to document and provide information that would be useful for investors. In order for states to ensure sustained pursuit of economic growth there must be inclusive participation and policy discourse by policy stakeholders. The role of the LG in supporting the creation and growth of new businesses should be one of facilitating community security interventions and advocating for creation of investment promotion office in every LGA. State and local governments should promote private-public partnerships by continuously developing a plan that is legislated and revised from time to time. They can also create an institutional framework to ensure effective implementation. The Lagos model has worked so other states can adopt it. To ensure effective collection and remittance of taxes governments should develop data bases of tax payers’ information and deploy ICT/payment platforms to collect taxes. State governments can adopt the Lagos model to ensure the informal sector is effectively taxed by fixing a convenient and affordable flat rate for the informal sector to pay thereby building the tax base. The self-employed and unemployed should also do a self-assessment. The most appropriate forms of income or assets to tax include property, income, rent, dividends and interest, signage, consumption taxes etc. In order to eliminate multiple taxation states should provide adequate funding to local governments so that they can carry out their responsibilities. States should also study and implement Company and Allied Practices (CAP) 2 laws of the Federation of Nigeria. States need to provide social services such as water and infrastructure to drive compliance with tax payment. 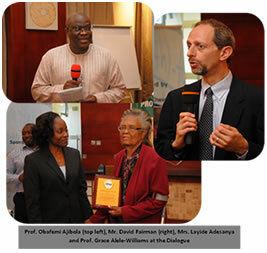 Plaques of appreciation were presented to speakers and facilitators by Prof. Grace Alele-Williams, FIND member and Vice Chairman, Board of New Nigeria Foundation. Prof. Obafemi Ajibola thanked all participants for their active participation and valuable contributions to the success of the Dialogue. 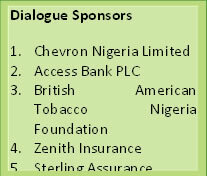 He also acknowledged the sponsors and thanked them for their financial support. He expressed appreciation to the speakers, as well as members of FIND and pledged FIND’s continued support towards promoting inclusive growth and economic diversification of states. Poor infrastructure, energy service and access to markets that limits industrialization. Limited capacity and technical skills in manufacturing sector. Inability of states to finance projects. Inability to collect desired level of revenue from local tax and inefficient billing system (limited adoption of e-payment systems). Poor attention to economic development in rural areas (limited incentives for investors in rural areas). Ineffective operations of Federal and State Inland Revenue Service (leakages, lack of transparency, lack of resources for effective and efficient collection). Entrenched inefficiencies and corruption in delivery of government-executed job creation programmes; (government should coordinate the process of job creation within their states rather than implement the projects). Limited capacity of state personnel for economic development in terms of skills, competence and expertise. Lack of coordination and cooperation among key ministries, departments and agencies. Limited state autonomy (federal government taking charge of issues that have to do with the states). Take responsibility for provision of energy and avoid relying on the national grid. Use ICT for revenue collection. Providing social safety nets to protect the chronically poor and to mitigate the risks of transitory livelihood shocks. Build win-win partnerships with the private sector (PPP models). Seek to sustain existing jobs while creating new opportunities for the jobless. Focus on sectors that are employment generating and value adding such as construction, agribusiness and agro-allied industries, ICT, wholesale and retail trade and the environment sector (promote waste to wealth investments). Encourage private sector investment in economic diversification and competitiveness. Develop job creation strategies (states can adopt recommendations from the Dalberg Report on Job Creation Strategy for Nigeria and consider ways to implement it within the states). Remove bottlenecks that hinder policy implementation or stifle growth of jobs. Track progress in job creation and develop job creation management system where states can account for the jobs created. The turnout of participants was impressive and the Dialogue was successful. The participants also had the opportunity to deepen their knowledge on sustainable development and inclusive growth in Nigeria and were able to share their experiences and engage in robust discussions that generated ideas for state to promote sustained development and inclusive growth. The event also increased FIND’s visibility among stakeholders across sectors and provided an opportunity for establishing partnerships. The next steps would be to leverage on the achievements of the Dialogue by developing an advocacy document (“Call to Action”) that articulates the ideas generated at the Dialogue which could be shared during FIND’s engagement with the states. It is also important to commence engagement with potential partners who indicated keen interest in the activities of FIND, in order to foster collaboration and support to the states interested in promoting inclusive sustained growth. NNF Continues to Work with PPCD to Promote Development in Niger Delta Region.